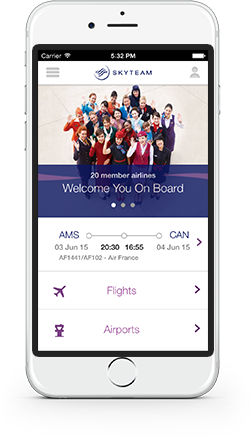 This website and/or phone or tablet app (hereinafter to be referred to as “the Website”) is owned by SkyTeam Airline Alliance Management Coöperatie U.A. (“SkyTeam”) having its registered office at Schiphol Boulevard 367, 1118 BJ Schiphol, The Netherlands. In these terms and conditions (the “Terms”), “User” and “you” refer to the user of the Website. The Website is provided solely to assist Users in gathering travel information and making legitimate reservations or otherwise transact business, and for no other purposes. Please read these Terms carefully before using the Website. Your use of the Website indicates that you agree to be bound by them. SkyTeam may update these Terms at any time without notice to the User. Consequently, SkyTeam advises the Users to consult them regularly. User agrees not to assign, transfer, or sublicense any of his rights pursuant to these Terms. User may allow other member of User’s household to use the Website under User’s name or account, provided that User hereby agrees to pay all charges that they incur and to be responsible for all aspects of their usage. User agrees to supervise all usage by minors of this Website under User’s name or account. User shall not reproduce, use, block, overwrite, copy, distribute or monitor any content of this Website by using any robot, spider, search engine or any other automatic mechanism without prior written consent of SkyTeam. User shall not take any action that will or could impose an excessive or disproportionately load on the Website infrastructure. The Website is owned and operated by SkyTeam and/or its suppliers (including SkyTeam Member airlines) and is protected by worldwide copyright laws. All trademark rights, copyright, data base rights and other intellectual property rights contained in this Website (and including SkyTeam brands and trademarks) are protected and belong to SkyTeam, the SkyTeam Member airlines, its licensors and/or its suppliers. No license is granted with respect to those intellectual property rights. All rights reserved on documents available for downloading (i.e. via the press center on the Website). The content of this Website has been compiled by SkyTeam from internal and external sources. However, neither SkyTeam, nor SkyTeam Member airlines (including without limitation their respective suppliers) make representation or give warranty as to the completeness or accuracy of such content as well as to its suitability for any purpose. In particular, you should be aware that this content may be incomplete, may contain errors or may have become out of date. This publication is provided “as is” without any warranty or condition of any kind, either express or implied, including but not limited to all implied warranties and conditions of merchantability, fitness for a particular purpose, title and non-infringement. In no event shall SkyTeam, SkyTeam Member airlines (including without limitation their respective suppliers) be liable for any direct, indirect, punitive, incidental, special or consequential damages arising out of or in any way connected with the use of this Website or with the delay or inability to use the Website, or from your reliance on content obtained through this Website, or otherwise arising out of the access to the Website whether based on contract, tort, negligence or any other cause of action. The Website may provide links or references to or parts of other Internet sites maintained by third parties including to sites of the suppliers (including SkyTeam Member airlines), solely for the convenience of the Users. SkyTeam is not responsible for the content of such other sites and can therefore not be held liable for any damage or injury arising from or in connection with such content of linked website. Neither SkyTeam nor SkyTeam Member airlines (or their respective suppliers) have responsibility for hyperlinks to these websites or in which any part of these websites has been hyperlinked. As a result, neither SkyTeam nor SkyTeam Member airlines (or their respective suppliers) shall be liable for any damages or injury arising from or in connection with such hyperlinks. You specifically acknowledge that neither SkyTeam nor any SkyTeam Member airline (or their respective suppliers) are liable for your defamatory, offensive, infringing or illegal materials or conduct, or that of third parties, and SkyTeam and its suppliers reserve the right to remove such materials from this Website without liability and/or notice. SkyTeam and its suppliers reserve the right to at their sole discretion deny access to the Website to anyone at any time. The Find Flight search engine is provided solely to assist Users - through a search engine - in gathering travel information, determining the availability of travel-related goods and services (the “Products”), such as flights from Skyteam Member airlines and an indication of the price thereof. The Products are not provided, owned or controlled by SkyTeam. They are owned, controlled and made available by suppliers, including SkyTeam Member airlines. The Website provides as well links to the relevant websites of the suppliers where Products are offered. These Products are subject to the terms and conditions imposed by those suppliers.As such, the User needs to enter into agreement with these suppliers directly and accept the general terms and conditions of such Vendor prevalent at that time in order to finalise any booking. SkyTeam is not a party to this booking process and will not bear the responsibility for this booking nor for the execution of the booking (i.e. the providing of the Product or Products by the Vendor(s)). In case questions or issues arise regarding any booking made with a Vendor or found through this Website, the User must contact the relevant Vendor. SkyTeam does not verify the content uploaded or made available by the suppliers on the Website and SkyTeam cannot guarantee the prices displayed on the Site. Prices on the Website are indicative only, additional charges, taxes and fees might be applicable. The final price will be established and indicated at the website of the Vendor, where the User purchases the Products. Some Products may also be sold by the Vendor in another currency than the one preset or chosen by you for the display of the search results. Actual currency exchange rates may vary and your payment provider (e.g. your credit card company) may charge conversion fees and apply another date’s currency rate. As a condition of use of the Website, the User agrees to indemnify SkyTeam, its SkyTeam Member airlines and its suppliers from and against any and all liabilities, expenses (including legal counsels’ fees) and damages arising out of claims resulting from User’s use of the Website. These Terms refer only to the use of the Website. Separate terms and conditions apply to the carriage of passengers, baggage and cargo by air and any other services and products available on or via the Website, such as Global Meetings discounted tickets and Round the World fares. Details of those other terms and conditions may be obtained from the relevant SkyTeam Member airline, the relevant section or relevant subdomain of the Website or the service provider (as applicable). These Terms are the entire agreement between User and SkyTeam with respect to the use of the Website. They are subject to the laws of the Netherlands, without regard to conflict of laws principles. In the event of any dispute arising out of or relating to the use of the Website and thus these Terms, the courts of Amsterdam, The Netherlands will have exclusive jurisdiction. If any part of these Terms is found to be invalid, illegal or unenforceable, the validity, legality and enforceability of the remaining provisions will not in any way be affected or impaired. The invalid or unenforceable provision will be deemed superseded by a valid, enforceable provision that most closely matches the intent of the original provision. SkyTeam’s failure or delay in enforcing any provision of these Terms at any time does not waive our right to enforce the same or any other provision(s) hereof in the future.